Approved for sunburn and numerous skin diseases (vitiligo, scleroderma). Sunscreen Pills prevent UV rays from penetrating into skin cells. May counter greying of the hair. 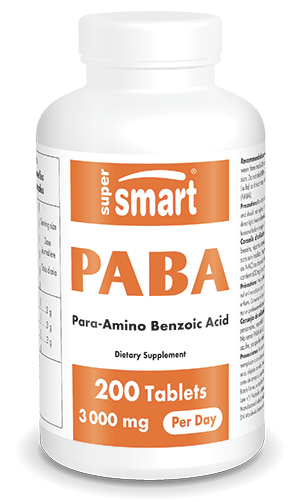 Para-amino benzoic acid (PABA) is a natural, water-soluble co-factor of the B group vitamins. An antioxidant, it can neutralize singlet oxygen and block the harmful effects of ultraviolet rays. it restores the original colour to grey hair in 10 to 25% of cases. Each tablet contains 600 mg of para-aminobenzoic acid (PABA). Take between one and five tablets a day, as required, spread out between three meals. Do not take more than 3g of PABA a day without medical supervision. Do not take PABA alongside sulphur-containing nutrients (MSM or NAC) or drugs (sulfa) as it inactivates them.